abstract This page describes iOS Automation in detail. If you wish to get a quick start, please read iOS Automation - Getting Started. Supports running scripts against a connected iOS device or simulator having version iOS 9.3 and above. iOS Viewer and Controller allow easy interaction with the connected device. 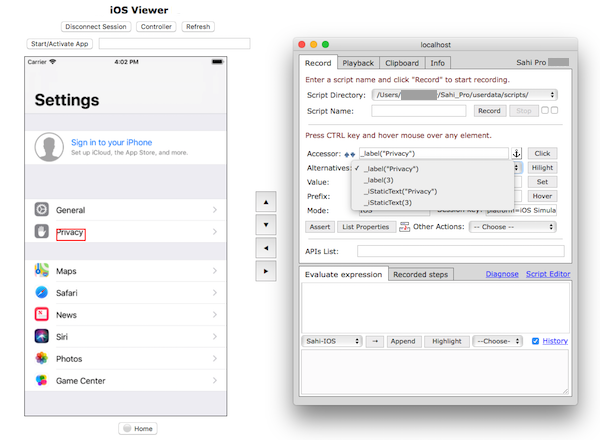 Scripts can be recorded from the iOS Viewer and Object spy features are also available. Scripts can be played back from the Controller, Editor, ANT etc. iOS API syntax is similar to Sahi Pro APIs used for browser testing. Does not support distributed run on multiple machines yet. Does not support testing on a remote iOS device yet. The iOS device needs to be connected to the Mac machine. The iOS simulator can be started in 3 different ways. It is not necessary that the simulator be started up prior to starting an iOS Viewer session or running a script. But it is advisable to explicitly start it beforehand. More details below. Explicitly start the simulator before running the test. This can be done in either of the following ways. Start the Simulator app from the Xcode menu - Xcode -> Open Developer Tool -> Simulator. This is a shell script that one can use to launch a Simulator from the command line. Open a Terminal shell and navigate to <SAHI_INSTALLATION_FOLDER>/userdata/bin/iOS folder. Run ./start_simulator.sh <SIMULATOR_UUID> where <SIMULATOR_UUID> refers to the UUID of the specific simulator. Simulator UUIDs can be obtained by running xcrun simctl list devices on a Terminal shell. When the simulator is started explicitly first, a test will simply run the script in the launched simulator. At the end of the script run, the simulator will remain open. The Simulator app is open, but the specific simulator is not running (the process is running, but the desired simulator is not running). In this case, the test will launch the simulator, run the script and close the simulator. Simulator app is shut down and no Simulator process is in memory. In this case, the script will launch the simulator in the background, run the script and close the simulator. The simulator will remain invisible through the duration of the script since it runs in the background. info NOTE: The script run can be quite slow if the simulator was not launched explicitly before the start of the test, since the simulator startup is part of the script run time. Testing on a device involves a few steps first. warningYou will need an Apple developer license to test an app on the device. This is needed since the device testing binary needs to be signed, for it to work on the device. The device has to be connected to the Mac machine through USB cable throughout the duration of the test. The device needs to be on the same Wi-Fi network as the Mac machine. Screen lock should be removed and display options should be set such that the device does not sleep during the execution of the script. Start up the iOS Viewer. Choose the iOS Device from Device Info dropdown. Type the application bundle identifier in the Application BundleId textbox. Click on Connect Session button. If the device binary does not exist then It will ask to build the device binary in iOS Viewer. info IMPORTANT NOTE: The device binary needs to be built once per Xcode version. This is not per device. Once built, you can test with multiple devices. If Xcode version changes, then iOS Viewer will shows to build the device binary for that Xcode version. Type the Team ID in the textbox to build the device binary. info NOTE: The Team IDcan be obtained from your Apple Developer Account page. info NOTE: User have to add his/her Apple ID to the Accounts section of Xcode on his/her machine. This is available from the Xcode menu - Xcode -> Preferences -> Accounts. Click on Build button. iOS Viewer will create a device binary and shows the appropriate result. After the device binary built successfully, click on Connect Session button. This will start the SahiTestApp application on the iOS Device, and the iOS Viewer will display the screenshot of the application. info This process does not required for testing iOS Simulator. 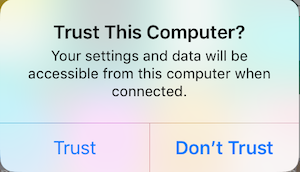 When the device is connected to the Mac for the first time, the user will get an alert on the device asking to Trust this computer. Choose the Trust option. 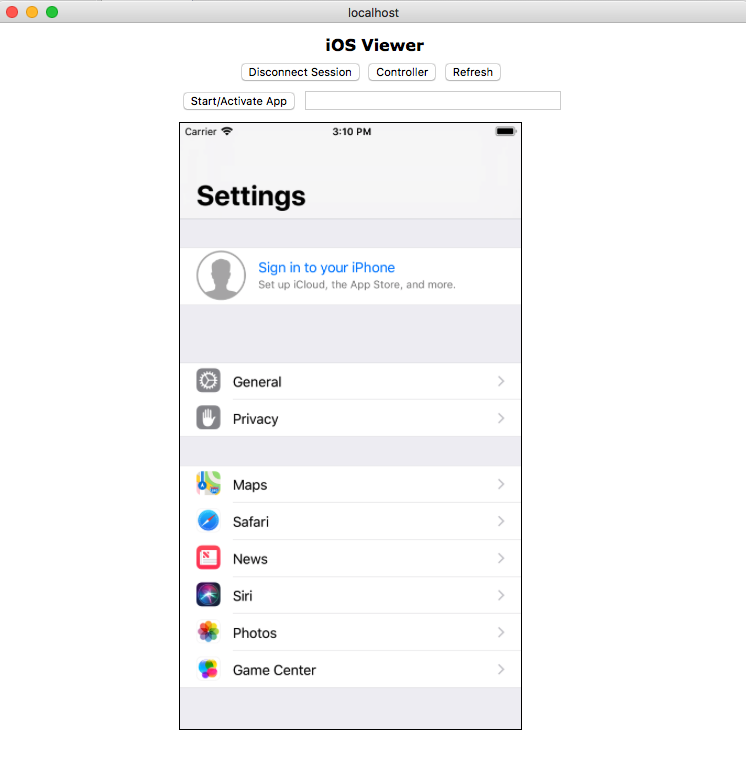 iOS Viewer allows an end user to view the iOS device/simulator screen on a Mac browser. The user can launch the Controller and then identify iOS elements by pressing the CTRL key and hovering the mouse over the elements in the Viewer. This section details how to use the iOS Viewer. The user can launch iOS Viewer directly from Sahi Dashboard by clicking iOS button. This brings up the iOS Viewer in the system's default browser. If the user wants to launch iOS Viewer in a different browser, one can open that Sahi browser from the Dashboard and click on the iOS Viewer link to bring up the iOS Viewer in that browser. Device Info: shows the list of devices connected to the Mac machine and simulators installed on the machine. If you are connecting to a Simulator, you may want to start the simulator first. Refer to Testing on a Simulator for details. Application BundleId: The user needs to choose an application to start the Viewer session with. This application needs to be available on the device/simulator. One can choose an application from the dropdown or enter a new application bundle id, ex: com.mycompany.myapp. When entering the app bundle id, one can give a name to it as well, like this, in brackets - com.mycompany.myapp (MyApp). info NOTE: If the viewer session is connected successfully, the application bundle id will be stored in app history so that the next time the user can simply choose it from the dropdown list. Typing MyApp will bring up the com.mycompany.myapp (MyApp) option. If you are connecting to a device, ensure that it is connected to the Mac machine through a USB cable. Ensure that the device and the Mac machine are connected to the same Wi-Fi network. Click on Connect Session. If the connection is successful, you will see three buttons Disconnect Session, Controller and Refresh. You will see also the device screenshot. If you encounter connection errors, refer to the connection troubleshooting section. When some action is performed from the iOS Viewer or from the Controller, the screenshot will be refreshed automatically. However, any actions performed through the Evaluate Expression box in the Controller will not cause a screenshot refresh. Click on the Refresh button manually to refresh the screenshot. infoAt times, the screenshot will not show the latest device state, particularly when the app is fetching some data from the network. In such cases, press the Refresh button to refresh the screenshot. One can interact with the device from the iOS Viewer itself without launching the Controller. Launch the Controller by clicking on the Controller button. This will bring up the Controller. This is exactly the same as a normal browser Controller, except that it is configured to interact with an iOS session. One can now start identifying elements by pressing the CTRL key and hovering the mouse over elements on the Viewer screenshot. One will notice the Accessor textbox on the Controller, showing the accessor for the element. The Alternatives dropdown displays the alternatives for the accessor. The image shows the Accessor and Alternatives for the "Privacy" label element. The Viewer shows the highlighted element. 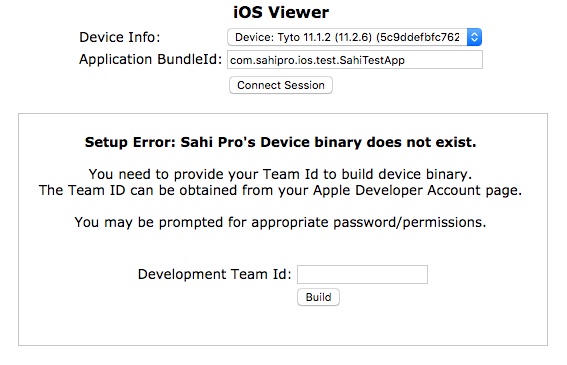 warningNote: While evaluating any line of code from the Evaluate expression box, make sure Sahi-IOS is selected in the Controller. If you resize the iOS Viewer page, do a manual refresh by clicking on the Refresh button, to view the screenshot correctly. Please disconnect the session by clicking on Disconnect Session before you disconnect the device from the Mac machine. Closing the iOS Viewer browser does NOT disconnect the session. So always disconnect the session before closing the browser. If you fail to do so and open the iOS Viewer again, it will show the session to be in a connected state. Click on the Configure link on the Dashboard. It will open up Sahi's configuration page. 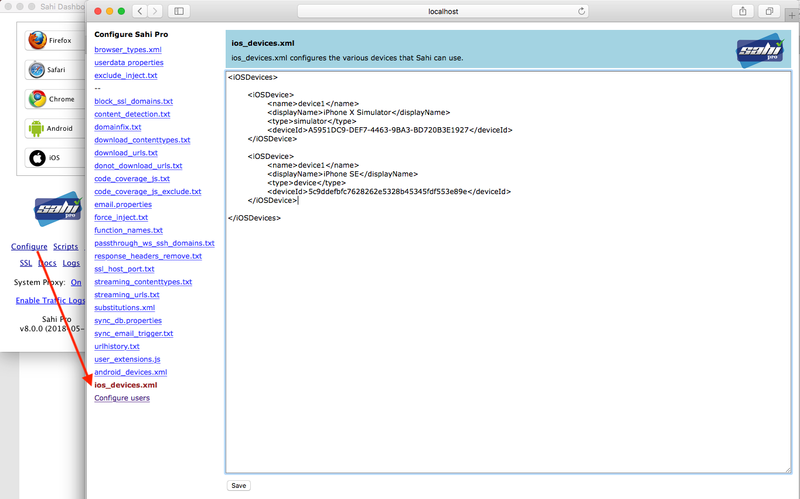 Click on ios_devices.xml on the left. displayName Better name displayed in iOS Viewer. infoFor example, Two devices are configured as device1. For parallel playback of data driven suite on this two devices, select device1 as IOS Device from editor (or specify device1 as iOSDevice in ANT target). Scripts will be distributed in two devices. There are a few reasons for connection issues that one may face, especially with a device. The error alerts will have useful information about what went wrong. If you connect to a device and the device binary does not exist, you will get an error indicating the same in iOS Viewer. Refer to Testing on a Device for building the device binary. The connection can also fail if the device is on a different network than the desktop, or is not able to connect to the desktop. 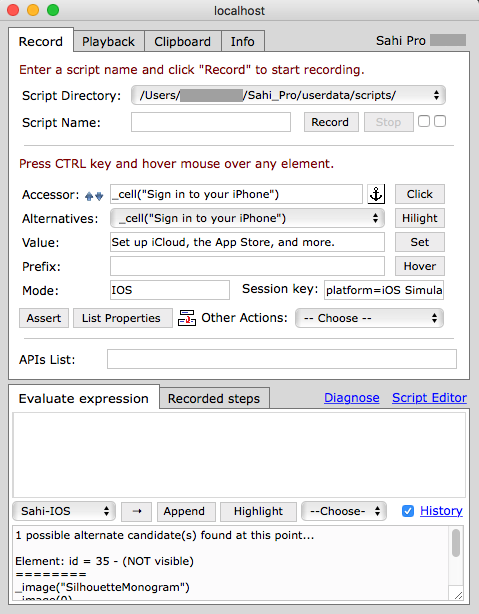 To record a script, launch the Controller from the iOS Viewer page, choose a script to record and press Record. Actions done from the iOS Viewer page are recorded automatically. Hovering the mouse over a textbox will overlay a textbox where one can type text in. After typing the text, press Enter or click outside the textbox. This will send the text content to the device. The _setValue/_setPassword step will get recorded automatically. The user can click on any other element. This will click the element on the device. The _click step will get recorded automatically. Steps can also be recorded from the Controller. One can use Click, Set, Assert, choose Other Actions, Test an expression from Evaluate Expression to perform an action on the Device. But one will need to record these steps explicitly by clicking on Append. The device screenshot will get refreshed after a Controller action is performed, except when it is from the Evaluate Expression box, in which case an explicit refresh is required. The user can continue to interact with the changing screen from the Viewer itself. If the device screenshot is not refreshed correctly, click on the Refresh button manually to reflect the current screenshot. infoFor more details on Controller, please refer to Sahi Controller and Java Controller. infoNote: When the script is being played back from the Controller, you cannot see the playback happening on the iOS Viewer. The iOS Viewer does not get refreshed during playback. User can playback a script/suite/scenario from the Editor as well. Choose a device to execute a script from IOS Device: dropdown. infoPlease refer to Editor Playback for more details on playback from the Editor. System dialogs in iOS are not visible to the automation APIs, so they cannot be automated by normal Sahi APIs. For example, one cannot induce a click on an Allow button in the system dialog. They are automated through a special flow. Before one expects a system dialog, one needs to setup the expectation by using _iExpectSystemDialog API. Pass the expected message and the accessor of the button to click. Perform actions that bring up the system dialog. In order to trigger the system dialog automation flow, one needs to interact with the app. Use _iInteractWithApp() for the same. If the expected message and the actual message match, and the button accessor is available, it will be clicked, and the dialog will be dismissed. This issue occurs on some iOS simulators. If there are multiple text fields in an app, automation of setting values may fail after a certain number of fields. The keyboard will not come up after the first few successful steps. To solve this, first ensure that the Hardware keyboard is setup correctly. The iOS Simulator sometimes has problems showing the keyboard. To make sure that the keyboard works, click on on any text field in the Simulator. Check if the keyboard appears. If you see the keyboard appearing, toggle the keyboard "twice" by clicking on [Hardware->Keyboard->Toggle Software Keyboard] from the Simulator app menu "twice". This will first hide the keyboard and show it again. If you do NOT see the keyboard appearing, toggle the keyboard "once" by clicking on [Hardware->Keyboard->Toggle Software Keyboard] from the Simulator app menu "once". This will simply show the keyboard once. After this, the text fields automation will succeed. Do the same if there are other keyboard problems. In the iOS Viewer, keyboard dimensions come up in Portrait orientation in Landscape mode. To record any keys, record in Portrait mode. In a webview, a textbox or password field may need an extra _click before the _setValue step. If an app requires the Location permission, and Location is not turned ON in Settings, the system dialog will show a button to launch Settings. Unfortunately clicking on Settings button will launch the Settings app and cause the current app to be deactivated. This eventually causes _iInteractWithApp() to fail. So such a dialog cannot be automated. Or in other words, any dialog button that causes invocation of a different app cannot be automated. warningTo workaround this, either turn Location ON from Settings manually or automate this step before the system dialog automation code kicks in. In such a case, the dialog will show the "Allow" and "Don't Allow" buttons, neither of which will launch a new app. If one wishes to automate clicking the "Don't Allow" button, note that the character between n and t is NOT a single quote. Either use a regular expression /Don. *Allow/ or use the exact specific character, as shown in userdata/scripts/demo/ios/systemdialogs/systemDialog1.sah - testCalendarSystemDialogSpecialCharacters method. Please refer to demo scripts in <SAHI_INSTALLATION_FOLDER>/userdata/scripts/demo/ios folder. 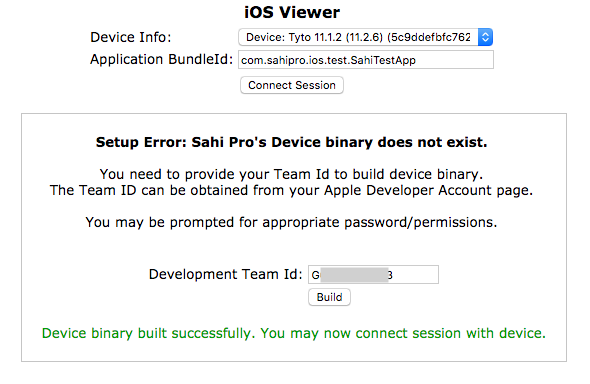 A few iOS Test Apps have been bundled with the Sahi Pro Mobile Add-on. The demo scripts make use of these test apps. To install these tests apps on your simulator, do the following. Start the specific simulator explicitly using the Simulator app or start_simulator.sh, as explained in Testing on a Simulator. Type ./install_testapps_on_simulator.sh <SIMULATOR_UUID> and press Enter. <SIMULATOR_UUID> refers to the UUID of the specific simulator. Simulator UUIDs can be obtained by running xcrun simctl list devices on a Terminal shell. This will install all the test apps on the specific simulator. Since they are test apps, their bundle ids have not been added to the apps history out of the box. Hence one will need to explicitly type in the testapp bundle id while connecting the Viewer session. Here is the list of the Test App bundle ids. This section contains information on miscellaneous topics. Prefer using a direct text accessor for best performance. For example: _button("Login"). Prefer using a direct text accessor that does not change. For example, value is not a good choice for _textbox, since it can change. So _textbox("johndoe") is not a good accessor. If a direct text accessor is not available, use an index accessor provided it does not change. Otherwise, prefer a relational (_in, _near) or positional (_rightOf, _leftOf...) accessor. _rightOf may be faster than _near in many cases. _parentNode() may be useful too. In iOS testing, an element is considered visible (_isVisible($el) will return true) if it is hittable. Clicking on an element that is not hittable causes internal test failures. infoHence we only display visible elements in the Controller Accessor and Alternatives. However, there are times when one wants to check the text of a non hittable element or whether it is selected, etc. In order to do so, the user will need the identifier for the element. To facilitate this, we show the identifiers of all possible alternate candidates, in the Controller result section. infoThe Accessor shows the smallest possible visible element at a point, while the alternate candidates contain those elements that are smaller than or equal in size to the Accessor. In iOS testing, interacting with any element requires the app which contains the element, to be in the foreground and activated. There are two scenarios when one would want to activate a new app. One wishes to explicitly launch a new app since the testcase requires interacting with more than one app. In either case, before one can interact with the new app, it has to be activated. Automatic activation - if the new app is part of the app history that Sahi stores, it will be activated automatically. If Sahi is not yet aware of the new app, the user will receive an alert indicating the app needs to be activated by specifying the application bundle id. Enter the app bundle id and click on Start/Activate app in the Viewer. Enter the app bundle id and click on Start/Activate app in the Viewer. If the app is in the background, it will just be activated. Else it will be launched newly. <SAHI_INSTALLATION_FOLDER>/userdata/scripts/demo/iOS/helperFunctions.sah lists a few helper functions that are useful in a Sahi script.